Corn is a common staple of cultural diets all over the globe. 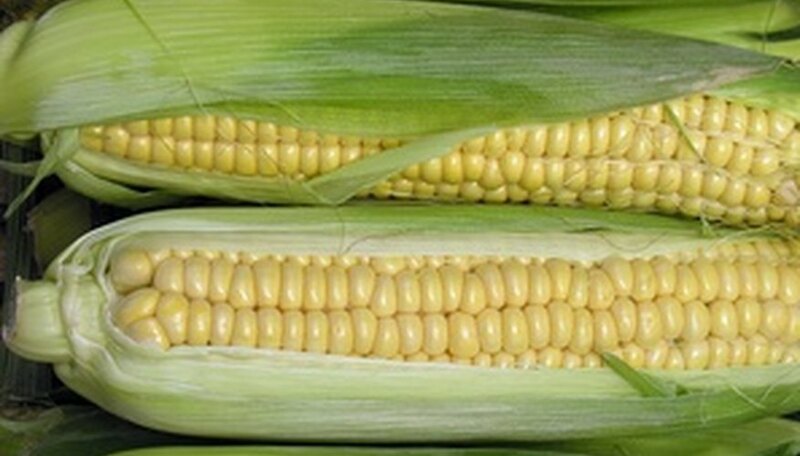 Two types, sweet corn and field corn, are divided into hundreds of other varieties. The distinction between sweet corn and field corn is significant. Sweet is primarily used for human consumption, while field corn is produced for livestock feed and other uses. Corn is especially prevalent in the Midwest, but is grown all over North America and other countries where the climate allows. For thousands of years, corn has been a staple. Corn is most recognized in history from the Native Americans, where it was called maize, and field corn dates to 200 B.C. Sweet corn wasn't documented until about 1779. Today, both types are used in almost every country on the planet for a variety of dishes, from creamed corn to popped corn. It is a common side dish for holidays such as Thanksgiving, and is a primary food source for livestock. More than 95 percent of corn grown in the United States is classified as field corn, harvested for animal feed (particularly dairy cows), corn syrup, corn meal, cooking oils and dried corn kernels. Field corn is not sweet because it is harvested much later when the kernels are dry and hard and all the sugar has been converted. Field corn also turns into the highly controversial high-fructose corn syrup (dextrose, sorbitol, and so forth), that is added to several products such as toothpaste and frozen Popsicles. Field corn also supports the production of medicine, adhesives, paper and plastic. Field corn grows about 2 feet taller on the stalk than sweet corn, but it uses three to four times more water during maturation. Although warm-season sweet corn makes up a very small percentage of corn production in North America, it can be found in practically any grocery store during summer barbecue season. It is more difficult to grow than field corn, as it is weaker against disease and pests. On the other hand, this crop is popular with home gardeners who grow small yields. Sweet corn gets its name from the kernels that have high moisture levels when they are harvested, so they are more milky. When it's harvested, the sugar hasn't had a chance to convert to starch, so the corn is harvested with a sweet flavor. Sweet corn is divided into three distinct types: normal sugary, sugary enhancer and supersweet. All corn needs proper pollination, but field corn and sweet corn should not cross-pollinate. While sweet corn needs soils around 60 degrees Fahrenheit for germination, field corn can withstand lower soil temperatures as long as the threat of frost has passed. Kernels should be spaced at least 12 inches apart with rows 3 feet apart, about 1/2 inch deep. Sweet corn and field corn should be planted at least 300 yards apart to avoid cross-pollination, but you must always have at least two to three rows of each to ensure pollination within a particular variety. Although field corn is used mostly to create other products, sweet corn can be used as well. Plastics are manufactured from both types of corn to replace petroleum-based products. These include batteries, packaging materials, plastic silverware and other plastic products (such as skin and hair care bottles), toothpaste, candles, shampoo and dozens of others. A corn-based fuel for transportation, ethanol, is added to gasoline and is sold at many gas stations. What Are the Seasons for Growing Wheat? What Is in Tiki Torch Fluid? What to Use to Kill Weeds in Sweet Corn Without Hurting the Corn? When Is Corn on the Cob Ready to Harvest?